In the middle of Parashat Korach comes a short story that I find to be one of the most moving in all of Torah. It arrives unexpectedly in the midst of yet another chilling story of rebellion. The parashah begins with more than 250 “Israelites, chieftains of the community, chosen in the assembly, men of repute,” who, under the leadership of Korah, Dathan, Abiram, and On turn against Moses and Aaron, saying: “You have gone too far! For all the community are holy, all of them, and the Eternal is in their midst. Why then do you raise yourselves above the Eternal’s congregation?” (Numbers 16:1-3). In their accusation, the leaders of the rebellion might seem to echo God’s own language at Mount Sinai, calling the Israelites “a kingdom of priests and a holy nation (goy kadosh)” (Exodus 19:6). Their logic, that when all are holy, none is above another, sounds right. But if the “rebels” merely echo God’s earlier sentiment, why does their rebellion anger God so much that the earth opens up and swallows them? Twentieth-century Jewish theologian Martin Buber1 explains God’s remarks at Mount Sinai by calling our attention to the “if” clause: ” If you will obey Me faithfully and keep My covenant, you shall be My treasured possession . . . you shall be to Me a kingdom of priests and a holy nation,” (Exodus 19:5-6). Korah’s error, teaches Buber, is in thinking that holiness is a given rather than a state that each of us must strive toward, working in partnership with God. Buber’s teaching shines a light on the actions of Aaron, who, in the terrifying consequences of the rebellion, risks his life to try to save the rebels. God said to Moses and Aaron, “Stand back from this community that I may annihilate them in an instant!” (Numbers 16:21). Moses and Aaron bravely convince God to do otherwise, falling on their faces and saying together, “O God, Source of the breath of all flesh! When one person sins, will You be wrathful with the whole community?” (16:22). In response, instead of annihilating the whole community, God takes the lives of “only” the rebel leaders, their families, and their followers. First “the earth opened its mouth and swallowed” Dathan, Abiram, and Korah along with their households (16:32), then a fire came forth from God and consumed the 250 other leaders (16:35), and then a plague fell suddenly on the people, killing an additional 14,700 (17:11,14). More than these numbered dead, it is how the plague is stopped that brings my tears. At the instruction of Moses, Aaron made an offering of expiation for the people. Then Aaron did something he was not instructed to do-he “ran to the midst of the congregation, where the plague had begun among the people . . . and he stood between the dead and the living, until the plague was checked,” (17:12-13). What makes me cry? This month, June 2013, marks a sad occasion-the thirty-second anniversary of the first-reported cases of AIDS in the United States. As a rabbi in a community devastated by illness and loss in the early years of this modern-day plague, I am blessed to know many people who, like Aaron, “ran to the midst of the congregation, where the plague had begun among the people” and “stood between the dead and the living until the plague was checked.” They are those who were lovers, partners, spouses, parents, children, health care workers, researchers, friends, family, neighbors, grief counselors, clergy, therapists, teachers, activists, legislators, journalists, writers, filmmakers, archivists; those who were infected, and those who were never or not-yet infected but fearing it; those who, despite their fears, despite the uncertainties and unknowns, “ran to the midst of the congregation,” and did what they could to try to stop the plague and ease the suffering, to soothe the ones still living who had lost the ones they loved; those who took a stand between the dead and the living in all sorts of ways including bearing witness and telling the stories. When I read of Aaron’s brave gesture, I think of those whose love or sense of decency activated them, those who continue to inspire us in a myriad of ways. When the first-century sage Hillel told us: “Be one of Aaron’s students, loving peace and pursuing it, loving people and bringing them to the Torah” ( Pirkei Avot 1:12)2, surely he was thinking, in part, of the actions of Aaron at this moment in the wilderness. It is Aaron, who risked his life by choosing to stand up for the living-even though those living were challenging him and his brother Moses, threatening them, making their life difficult. 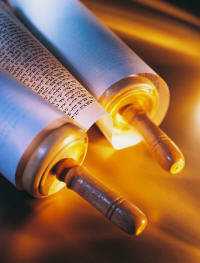 It is Aaron, who, despite the anger raging between the people and God, understood that these people were God’s people. It is Aaron, lover and pursuer of peace, whose actions bring an end to the enmity and the violence. In the next scene, God brings a different amazement-not the earth swallowing whole families, not a plague killing thousands, but a much subtler, far gentler miracle: God causes Aaron’s staff-a symbol of his leadership-to sprout, bringing forth flowers and almonds. God then instructs Moses, as a reminder to the people, to place Aaron’s blossoming staff in front of the stone tablets of the Pact-the second set of stone tablets, Judaism’s enduring symbol of second chances. The frightened, angry Israelites, still stinging from the punishments doled out by God, don’t yet understand the message, but we, who look from a greater distance, can. Still today, no matter what challenges we face, these images of bloom and stone remind us of Judaism’s rock-solid foundation and perpetual growth, making us grateful to Aaron and God for their abiding invitation to embrace the Covenant and choose life. Rabbi Lisa Edwards, Ph.D. is the leader of Beth Chayim Chadashim in Los Angeles. Founded in 1972 as the world’s first lesbian and gay synagogue, today BCC is an inclusive community of progressive lesbian, gay, bisexual, transgender, and heterosexual Jews, and their families and friends. Rabbi Edwards’ writing appears in books including Kulanu: All of Us (a URJ handbook for congregational inclusion of gay and lesbian Jews) and The Torah: A Women’s Commentary, published by URJ Press and Women of Reform Judaism.